I'm in South Dakota today at the office. I drove in yesterday afternoon/evening. It takes about 3 1/2 hours to get to Mike's from my house, and I usually stop for a fast food dinner somewhere. I shouldn't, but I do. In order to keep myself awake, I have invented a little routine. I have a bag of some sort of vegetable, yesterday it was baby carrots. I have a cut up fruit of some kind, yesterday it was clementines. Then I get a bag of what I call packing material (cheese puffs of some kind. Guess why I call them packing material?). And then I get a water bottle. Matt and Hayley weren't that much trouble though. Another missionary came home yesterday. When we had EJ's farewell open house, we combined with two other families who had missionaries leaving the week before EJ. Well, those two other boys are now home. From the mother's point of view, waiting for a missionary to come home is a lot like being pregnant, only when the child comes, 1) he'll be fully functional and will be able to communicate (although I expect some Spanglish), 2) I know the exact date and time of his arrival, and 3) I won't feel like I've been beat up afterwards. I drove Hayley and Matt to seminary this morning and when I got home, Jim had made breakfast. This was a first! I almost wondered if he had an ulterior motive. But no, he was just being nice. I think he's going to miss me a little (I have to go to the office today and I'll be there til Friday). ONE WEEK. I can hardly stand it! Congratulations to a niece who got accepted to a great place to go to college (which is the same place EJ went for 2 semesters, and where he will return to in April most likely--we hope)! Since EJ and Niece could possibly cross paths, I suggested to my sister, Niece's mother, via text that EJ could possibly set Niece up with a couple of returned missionary friends. I think that would be great! My sister must think it's a great idea too, because she texted back a couple of exclamation points. We got our missionary emails today and that leaves JUST ONE MORE FROM EJ. Only one more mission email EVER from him! And at that time, he will probably be finished with normal missionary work because it will be Pday and he will most likely be going to the mission office and staying there until Tues morning when his flight leaves. HIS FLIGHT TO MINNEAPOLIS! I went to the dentist today (not the one that I work for) and got my teeth cleaned. I like going to my local dentist because the hygienist and the dentist spend the whole time telling me how great my teeth are. It's a half-an-hour love-fest. Today we added another hygienist to the party, because my regular one had carpal tunnel surgery. Whenever I need a self-esteem boost, I get my teeth cleaned. I can hardly leave without feeling like I've won a beauty pageant. I got a Samsung mini-tablet for my birthday, and with it came a very lovely white charging cord. The best thing about this charging cord is that it's fast. It juices up my phone and the tablet much faster than any of the other cords I have hanging around the house. Servo has recently discovered this cord and likes nothing better than to chew on it. I keep it in my room and over the last two days, if I forget to shut my bedroom door for any length of time, I'll go in my room and find Servo with the cord in his mouth. Magic likes to come in our room too, but all he does is hide out under the bed and lick himself. So, now I have to be better at remembering to put the cord in a drawer when it isn't being used, and I have to remember to shut the bedroom door. Magic will have to find somewhere else to lick himself and Servo will have to stay out of my way for a while. Bet you can't guess what I'm counting down. Anyway, this post isn't about that. 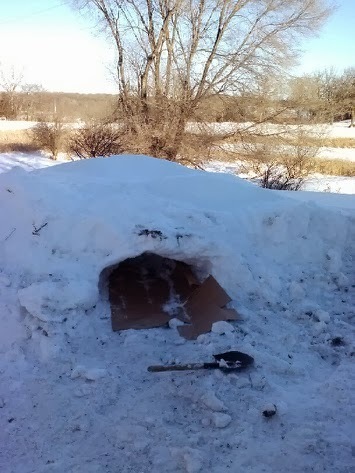 It's a snow cave. It was also where Matt slept last night (well, for most of the night). The details are still unknown, but I have verification from Jim that Matt dug the cave, shoved the cardboard in it, and bundled up in whatever woolen gear he had and zipped himself into the heavy duty sleeping bag and spent the night in this hole until 4 a.m.
All I can think of is COLD and hopefully he slept with his feet towards the back of the cave, because I would get the willies, the heebie-jeebies, the creepy-crawlies, and the hackles raised if he had gone in head first. I don't consider myself especially claustrophobic, but if I went in head-first and stayed there any more than a minute, I'm pretty sure a panic attack would find its way in there with me and take up most of the air available for breathing. I was actually motivated to do housework. I also actually had time to do it. I had the whole day yesterday to get things accomplished. Too bad my quadriceps felt like dogs had shredded them, thanks to an overzealous personal trainer who "just wanted to see where I was at fitness-wise." Never trust personal trainers! after three sets of walking lunges, I wanted to chop my legs off. And then his. (I signed up at a little fitness club and with the sign-up I got two free sessions with a personal trainer. First they get you to sign up, then they try to kill you for free) But I kept going--squat/jumps, squats on a half-ball thing, a wall sit, and then the trainer said, "Last one, burpees." I said, "Nope. I'm not going to do them." I would have put my foot down, but everything from my hips downward seemed to be possessed by Jell-O.